It would be hard to overestimate the role mobile is playing in bridging the gap between ecommerce and in store retail purchases. While the first wave of mobile commerce focused on optimizing the user experience for purchasing from mobile versions of ecommerce sites, the second wave addressed the need for omnichannel solutions that provide consumers with more integrated in-store and online shopping experiences. Today, we approach the third wave of mobile commerce: mobile wallets. Retailers look at mobile wallets as the missing piece for finally connecting online and in-store behavior, using customer lifetime value to guide segmentation and power even more personalized marketing programs. Consumers, who are looking to mobile wallets for convenience and payment integration, are also aware of the potential benefits of their loyalty because of points programs, exclusive deals, and more relevant offers. 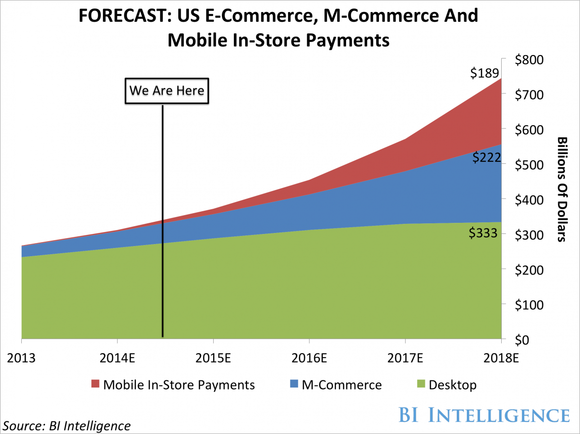 So why has adoption of existing mobile payment solutions in the U.S. been low? Mostly because the market is so fragmented and consumers are waiting for a single, generally accepted mobile wallet. And while retailers know they have to move quickly, they too are waiting to see what consumers adopt before taking on financial and operational risks associated with changing POS systems. But some of the biggest players in the industry have made moves recently that indicate the U.S. market will see major changes in the next year. On September 30, eBay and PayPal announced their separation with PayPal becoming its own publicly traded company sometime in 2015. PayPal has been acquiring mobile payment companies and appears to be positioning themselves more toward in-person mobile transactions than online shopping. Like banks and other financial institutions, PayPal is a trusted brand in online payment that consumers will most likely follow into the mobile payment space. It’s also been rumored that PayPal will be making several more acquisitions to round out their mobile capabilities. Only a few weeks before, Apple announced Apple Pay, a new mobile payment service, powered by NFC (Near-Field Communication—a set of standards for smartphones and mobile devices to establish radio communication with each other by bringing them into close proximity). Apple Pay is compatible with MasterCard, American Express and Visa credit and debit cards and has 220,000 U.S. retail partners at launch. NFC is not new. Many countries around the world have already adopted the technology (for things like banking, replacing parking meters, and paying at vending machines), and the technology has been available on Android phones for a while. But like most new initiatives from Apple, U.S. consumers will start feeling a cultural shift in attitude towards mobile wallets. And just days before Apple’s announcement, MCX (Merchant Customer Exchange), a consortium of over 70 of the largest retailers in the U.S., announced a software-based solution, CurrentC, that will work with most existing point-of-sale terminals, giving merchants a cost-effective solution (no additional hardware is required because CurrentC uses a secure paycode to complete the transaction). It is worth noting that while CurrentC will be available to download free through both the App Store℠ and Google Play™ store, it is being billed as an alternative to Apple Pay (although there have already been reports that some CurrentC retailers will be). So while many are looking at 2014 as the ‘tipping point’ for mobile wallets, it remains to be seen if any one provider can create enough scale in a short period of time or if the industry requires more consolidation. Regardless of when it happens, mobile wallets will create even greater opportunities for data-driven marketing and redefine what it means to be omnichannel.